The SUPERNOVA is a new moissanite available now, and we are SUPER excited (see what I did there?) to be the first retailer on the planet to sell them! They are gorgeous, and are being cut in a huge array of sizes. Plus, we can also get custom cuts, so if you were interested in, say, a 12 carat emerald cut let us know, we gotcha covered. The SUPERNOVA is a colorless stone, D-F in color. D is as good as it gets, when it comes to color in a white gemstone. Isn't it odd that the scale begins with D, and not A? This is why: Historically, metaphoric terms were used in the very old days. “River” and “water” were used for the most colorless diamonds, or they might be categorized by a geographic location from places where similarly colored diamonds were seen. For instance, there was “Cape” for pale yellow diamonds from the Cape of Good Hope. HOW ABOUT THEIR CUTS & SIZES? Their cuts were all developed by an engineer at Moissanite International. If you'd like a funky anniversary band with a bunch of pear cuts, a delicious but not too big 3 carat oval, or a whopping 9 carat emerald cut, we've got all those, and more. If you want a custom cut stone in a size we don't typically offer, let us know, we can do that, too. Like twenty carats. Ain't no joke. DO THEY HAVE COLORLESS MELEE? They are the only company that has created a colorless melee, which are the tiny diamonds used in settings. As new moissanites continue to flood the market, you'll find pricing will be all over the place - a higher price does not necessarily mean higher quality. Some pricing examples: a SUPERNOVA 1 carat round will run ya $440, and a 2 carat round $925, 3 carat is $1,410. The fancy cuts are a bit higher but still a fab price, especially when compared to a diamond. The SUPERNOVA hails from down unda, they are manufactured by Moissanite International. 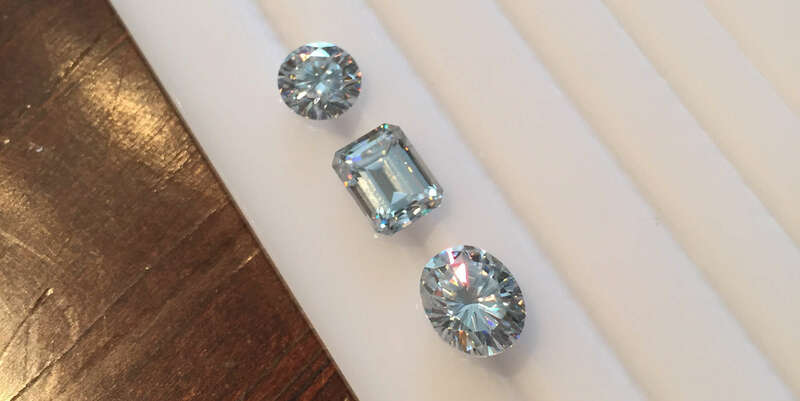 The folks who developed these beautiful stones not only have the coolest accents eva, they have been selling moissanite for many years, so they know their stuff. They are the only manufacturer we work with that has all the magic happening under one roof - they formulate their own pure Silicon Carbide powder, grow the material, cut the rough and then the jewels with 65 on-site cutters. Pretty awesome. They will only be selling these stones to the trade, not direct - meaning you can purchase them in all their gorgeousness here at JHD.